The Terminal High Altitude Area Defense (THAAD) element provides the Ballistic Missile Defense System (BMDS) with a globally transportable, rapidly deployable capability to intercept and destroy ballistic missiles inside or just outside the atmosphere during their final, or terminal, phase of flight. THAAD Batteries consist of four main components: launcher, interceptor, Radar, and Fire Control unit. The launcher is truck mounted and highly mobile, able to carry up to eight interceptors that can be rapidly fired and reloaded. Each THAAD interceptor has a range of about 200 km and uses hit-to-kill technology where the incoming threat is destroyed by kinetic energy. [i]THAAD uses Army Navy/Transportable Radar Surveillance (AN/TPY-2), which is the largest air-transportable X-band Radar to search, track, and discriminate objects at a range of up 1,000 km and provide tracking data to the missile interceptor. [ii]The THAAD fire control unit is the communications backbone of the battery linking the THAAD components and linking the THAAD battery to external command and control and other BMDS elements. THAAD has undergone numerous intercept, non-intercept, and interoperability tests and boasts a current record of 15/15 successful tests. Regional Defense. Like Patriot Missile Defense Systems, THAAD intercepts missiles during their terminal phase of flight, but provides theater-wide protection that Patriot systems cannot. THAAD is designed to protect against short (up to 1,000 km), medium (1,000 – 3,000 km), and intermediate (3,000 – 5,000 km) range ballistic missiles either inside or just outside the atmosphere, offering greater protection for troops by intercepting the incoming missile further from its target. THAAD is able to accept cues from Aegis, satellites, and other external sensors to extend its coverage area and can in concert with Patriot/PAC-3 and the Command, Control, Battle Management and Communications (C2BMC) system. [iii]THAAD’s greater radar coverage is also designed to counter mass raids and can be deployed as part of a layered defense system. International Cooperation. While THAAD is a relatively new missile defense system, a number of countries have expressed interest in deploying it. In December 2011, the United States and the United Arab Emirates (UAE) reached an arms deal worth $3.48 billion for the UAE to purchase two THAAD systems, missiles, radar system, parts, and training. [iv]This arms deal made the UAE the first international recipient of the THAAD system. Other countries such as Saudi Arabia and Qatar have expressed interest in the system[v]and are in discussions with U.S. contractor, Lockheed Martin who produces the defense system. Deployment. The U.S. Army activated the first THAAD battery in 2008 at Fort Bliss in Texas, but no batteries were deployed until April 2013. In 2013, the U.S. deployed a THAAD Battery to Guam to improve missile defenses around the island and counter the threat of North Korean missiles. This deployment came in response to North Korea’s third nuclear test, threats to “sweep away” Guam’s Andersen Air Force base, and North Korea’s moving of two Musudan IRBMs to its East Coast. There is still a THAAD battery deployed on Guam and studies are currently underway to look at the possibility of permanently deploying a THAAD battery on Guam. On March 6, 2017, the first parts of THAAD arrived at Osan Air Force Base and then on September 6, 2017, the final pieces of THAAD were deployed to South Korea. As of December 2017, the United States is considering deploying THAAD to the west coast to defend against a nuclear-armed North Korea. The South Korean leadership recently authorized deployment of a U.S. THAAD to the peninsula. The BMD system will be fielded in Seongju in southeast South Korea and will provide missile defense for areas within its 200 km range, including Seoul. This decision has incited outspoken opposition from leadership in China, whom express concern regarding the range of the AN/TPY-2 radar, which can detect missile launches and activity up to 1,000 km away in Chinese territory. This would put parts of mainland China and parts of eastern Russia within range of the radar, causing China to express concern about the possibility of the U.S. monitoring its missile activity. The possible deployment or sale of THAAD systems to Japan is an on-going discussion with implications for the Pacific region, yet, Japan–like South Korea–also faces the diplomatic opposition from China. September 6, 2017: The final pieces of THAAD were deployed to South Korea. July 30, 2017: The U.S. Missile Defense Agency announced that THAAD conducted intercepted a medium range ballistic missile target during FET-01 at Pacific Spaceport Complex in Alaska. The ballistic missile target was air-launched by a U.S. Air Force C-17. July 11, 2017:The U.S. Missile Defense Agency announced that THAAD conducted intercepted an intermediate-range ballistic missile target during FTT-18 at Pacific Spaceport Complex in Alaska. The ballistic missile target was air-launched by a U.S. Air Force C-17 over the Pacific Ocean north of Hawaii prior to being intercepted by THAAD. April 26, 2017:South Korea announced that elements of the U.S. THAAD battery were being operationally deployed to a golf course in Seongju South Korea. March 6, 2017:The first elements of THAAD arrive at Osan Air Force Base, South Korea. July 8, 2016:It was announced that a U.S. THAAD would be deployed to South Korea to defend against North Korean ballistic missiles. 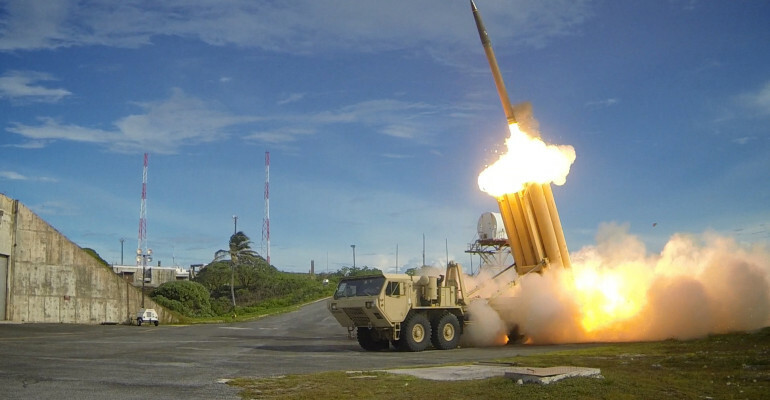 2015:The U.S. activated the fifth of seven planned THAAD Batteries at the end of the year. 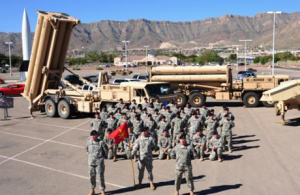 2014:The fourth THAAD Battery was activated at Fort Bliss, Texas. April 2013:The U.S. deployed a THAAD Battery to Guam to improve missile defenses around the island and counter the threat of North Korean missiles. October 2012:The third THAAD Battery, D-2 battery, was activated at Fort Bliss, Texas. December 2011:The United Arab Emirates became the first international recipient of the THAAD system. June 25, 2008:The THAAD system successfully conducted its 35th of 43 hit-to-kill intercept since 2001. May 2008:The first THAAD Battery, A-4 Battery, was activated at Fort Bliss, Texas. Between December 1995 and May 1999:The THAAD system failed six flight tests by failing to intercept its target or due to interceptor issues.